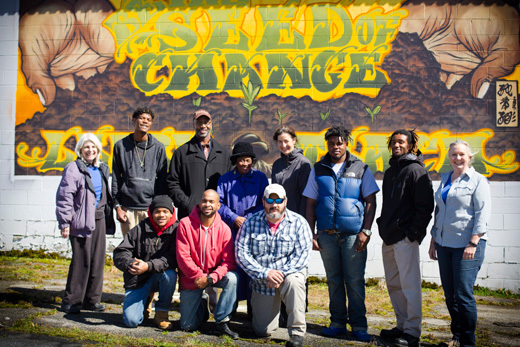 When the Emory Urban Health Initiative (UHI) first helped an organic community teaching garden take root in the parking lot of the Super Giant Foods grocery store in Northwest Atlanta’s Bankhead neighborhood, the goal was to tackle issues of food access and poverty where they lived. By all measures, the project has succeeded — drawing local residents and community partners to help teach gardening, cooking and nutrition classes while growing fresh produce that has been provided at no cost to residents of an area that, if not strictly a food desert, suffered from limited grocery options. So when the Super Giant Foods store abruptly closed last month, no one was willing to let a project that was making a difference in so many lives simply disappear, says Carolyn Aidman, associate director of the UHI. "When the store closed, without access to water and electricity, we knew we had to move," Aidman says. "But there was never any thought of this going away," she says. "If anything, the lesson we’ve learned from all of this is that we have to be resilient. We can’t fall down, we just have to be smart and pull together, which is what we’ve done." Since then, Emory and community volunteers have partnered to relocate the garden to a new site about a mile away. The new garden will be situated at 1225 Donald Lee Hollowell Parkway near the Northwest Youth Power daycare center and the Asa Yancey Grady Clinic — an ideal location to engage local children at the nearby partner preschool and attract patients and visitors from the clinic. "In low-resourced neighborhoods, the only thing that is really constant is change," says Joan Wilson, assistant director of the UHI. "At our new garden location we will build upon what we learned from the Super Giant Community Garden, and we have every reason to believe that it will be just as successful, or more so." In February, during some of the coldest days of the year to date, representatives from Emory UHI and Volunteer Emory joined community members and Grow Where You Are to help disassemble the greenhouse and wooden frames of the raised garden beds and move everything to the new location. Volunteer Emory brings a group of students to what is now known as the Northwest Youth Power Garden every Wednesday afternoon. A big Garden Build Out event will be held in the next few weeks, with details to be announced. To date, the program has received help from student volunteers representing Emory College, Rollins School of Public Health, the Emory School of Medicine, the Nell Hodgson Woodruff School of Nursing, the Emory and Georgia Tech chapters of RING (Resource and Insurance Navigator Group) and Emory’s Ethics and Servant Leadership program. Overall, it’s been a richly symbiotic relationship, says Wilson. To many of the residents of the Bankhead community, as well as to the volunteers who’ve worked there, the garden became "a place where many of our students, some of who are preparing for careers in medicine, learned first-hand about the social determinants of health and the issues that lead to worse health outcomes than for those in some of the surrounding, more affluent neighborhoods," she explains. "We frequently hear stories from our student volunteers about things that the community members have taught them, when they (the students) thought they were going into the community to help or teach the residents," she adds. The Super Giant Foods Community Garden project was originally created in response to a needs assessment conducted by the Rollins School of Public Health. Since 2011, Emory undergraduate and graduate students have been working with the community, canvassing shoppers and employees at the grocery store, as well as residents at a nearby Section 8 apartment complex, to gather information about the needs of the region. That assessment documented the impacts of living in an area with few options and outlets for buying food, says Aidman. With a new garden situated near the Bankhead MARTA station and offices for the Georgia Division of Family and Children’s Services (DFCS), the location should create new opportunities for community access and engagement, she adds. "We’d like to have children there to help fill and tend our beds and are already planning to host our first gardening boot camp for 3 and 4 year-olds to teach them about soil and seeds," Aidman says. "Then we hope they’ll bring out their parents and grandparents who can share in their own gardening experience." Aidman says they have already seen signs that neighbors involved in the original Super Giant Community Garden are willing and eager to follow the garden. When the project was under development, Aidman recalls one of the first residents to join them. "As soon as we started building the garden, Miss Olivia came right over to see what we were doing," she says. "When we explained what we were planning, she said, ‘Honey, you are the answer to my prayers — I have been sitting in my apartment overlooking the parking lot just wishing I had a chance to grow.’"
Despite the relocation, that bond remains, Aidman says. "She’s already been over to visit our new location, proclaiming that this is part of her ‘heart work.’ She loves the students, and she’s teaching us all so much."